WELCOMING ALL NEW PATIENTS TO OUR FRIENDLY, GENTLE AND COMPASSIONATE DENTAL PRACTICE! Desert Dental Spa - Cosmetic & Family Dentistry! When you visit Desert Dental Spa in Palm Desert, CA your smile & comfort is our top priority. Led by Dr. Maisy Ibrahim, our entire team of professionals is dedicated to providing you with the personalized, quality dental care that you deserve. Located at 41990 Cook Street in suite #402 we are proud to serve patients from Palm Desert, Palm Springs, Cathedral City, Indio, Rancho Mirage, Thousand Palms, La Quinta, Coachella & all of the Inland Empire. Upon entering the doorway, you will hear whisperings of cascading waters. A timeless elegance and a tranquil décor will unfold before your eyes. Our office atmosphere will be a reminder that you are in a different, uniquely special place. 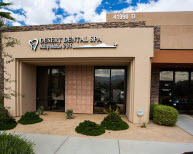 Desert Dental Spa in Palm Desert, CA led by family dentist Dr. Maisy Ibrahim proudly provides general, cosmetic, and family dentistry to Palm Desert, Palm Springs, Cathedral City, Indio and beyond.